IBM is planning yet another round of layoffs. Private jet firm Bombardier is shedding 1,700 jobs. Sprint will lay off up to 500 people in the first half of the year. Intel is laying off 5,000 this year, even as they made a statement that performance was solid and improving. Really? Citi is laying off nearly 1,000 workers. Even more serious is the news from a large swath of the retail sector in the aftermath of a very disappointing holiday season. Retail giant JC Penney will close 33 stores and lay off more than 2,000 people. Sears/Kmart has entered what looks like a death spiral, hemorrhaging money, jobs and stores. Macy’s is laying off 2,500 people and closing five stores. Loehmann’s has announced it is going out of business altogether, closing 39 stores and liquidating everything. Even Barnes & Noble is having trouble. Much of what the retail sector is going through makes perfect sense. Shopping is moving ever more online. For retailers, keeping up with an expensive (and redundant) piece of real estate is just not going to make business sense much longer when their web presence accounts for the lion’s share of their sales. Of course the scandal involving compromised data of Target brick and mortar store shoppers doesn’t help. What will our shopping experience look like five or ten years from now? Is the shopping mall going the way of the dinosaur as we watch anchor stores shutter one by one? Things are changing with technology and new habits, and that means lost jobs, bankruptcies, liquidation and pain for lots of people. But as we’ve said before, bankruptcies are sometimes necessary; the economy has to retool itself with the changing market. With any luck, someone will come along with a promising new idea and buy up some capital goods at rock bottom prices and do something wonderful with them that we would never dream of. That’s the way economies work. They change, they adapt, they evolve… if we let them. The problem is we haven’t been letting the financial sector go through this kind of change that is required. Quantitative Easing has been (and still is) propping up status quo business models that are clearly not working. Instead of letting nature take its course with AIG and GM and big banks, the Federal Reserve has gone into full-on panic mode, buying up bonds and assets left and right with newly created funny money. 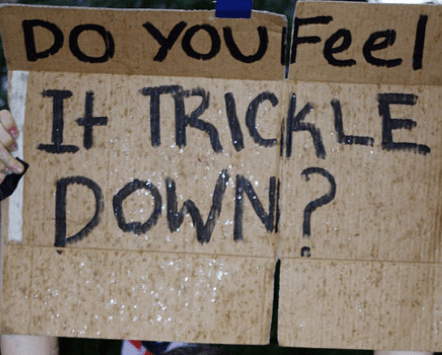 Those trillions of dollars have pumped up the market, of course, but they have yet to trickle down into the economy at large, and so the inflationary effects are yet to be seen. If the bad news continues, it would almost be too predictable for soon-to-be Fed Chair Janet Yellen to freak out about the retail sector and initiate some sort of massive bail-out, prop-up scheme there as well. Hey, they’ve already done it for cars and insurance and banking. What’s one more massive swath of the economy on the government dole? In any case, evidence of the recovery continues to remain thin… if it can be found at all. The stock market has been up, relatively speaking, but unfortunately it has long since lost any relationship to reality. When the market is as volatile and disconnected as it is right now, the closest thing to a sure bet is precious metals. All roads right now are leading to a more and more worthless dollar. Nothing has such a solid and steady track record as a store of wealth than gold. While there’s still time – give us a call or click here to request a free investment kit.